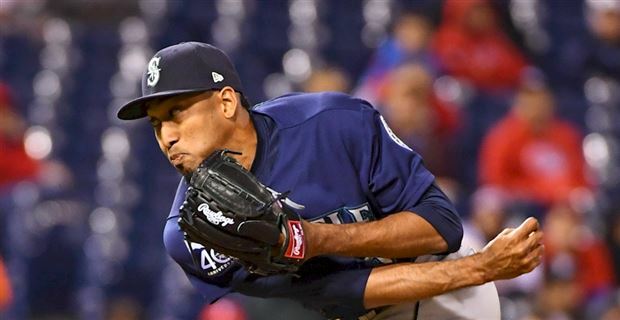 Senior Fantasy Baseball Expert Shawn Childs provides an in-depth outlook on each batter and pitcher on the Seattle Mariners as they attempt to compete for a postseason spot! The Mariners haven’t made the playoffs since 2001, which was their magical season when they won 116 games. Seattle scored 927 runs that season while allowing only 627 runs. Their failure in 2017 was due to a step back in pitching (4.46 ERA – 15th in the majors). The Mariners finished 11th in bullpen ERA (4.08). They scored 18 fewer runs than 2016 (768) with 200 home runs (17th). In the offseason, Seatle lost 1B Yonder Alonso, OF Danny Valencia, C Carlos Ruiz, and Jarrod Dyson to free agency from the offensive side of the ball. They traded three minor leaguers for Dee Gordon who will be shifted to center field. The Mariners acquired 1B Ryon Healy from the A’s for P Emilio Pagan and SS Alexander Campos. Andrew Romine was claimed to compete for a backup infield job. The offense has five strong returning players, which will put Seattle in a competitive battle on the hitting side of the ball. 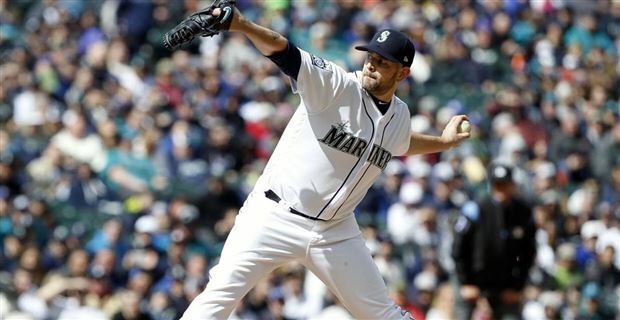 The starting rotation will be dependent on Felix Hernandez regaining his form and James Paxton taking a step forward with a full healthy season. Behind the top two starters, Seattle has a combination of veteran inning eaters and a couple of potential upside arms. RP Juan Nicasio was signed to upgrade the bullpen depth. Overall, Seattle can’t match the Houston Astros’ pitching depth, but the Mariners can still be competitive if two arms step up to give them productive innings. The bullpen should have a stud in the 9th inning with Edwin Diaz. This team is a Wild Card contender for the playoffs. Gordon set a career high in runs (114) thanks to his second season with 200+ hits and Giancarlo Stanton turning into a beast behind him in the starting lineup. He scored 50 percent of the time when he was on base. His average hit rate (1.219) was the lowest of his career as a starter. Dee had the lowest K rate (13.4) of his career with continued failure in his walk rate (3.6). Over his last 428 at-bats of the season, Gordon hit .325 with 84 runs, two HRs, 22 RBI, and 42 SBs. He handled himself well against both RH (.314 BAA) and LH (.293) pitching. His swing delivers a huge volume of fly balls (57.6) with a HR/FB rate (1.9) that barely has a pulse. Pretty straightforward here, impact base stealer who should offer an edge in runs and batting average. His power and RBI total have no chance of adding value to a Fantasy roster. Dee needs to add a few more walks to help his runs and possible stolen base chances. Possible .300 with 100+ runs and 65+ SBs. The switch to Seattle looks like a parallel move as far as scoring opportunity. Segura played well over his first eight games (.313 with one HR and three RBI) before landing on the DL with a hamstring issue. After missing a couple of weeks, Jean continued to shine (.347 with 23 runs, three HRs, 17 RBI, and four SBs over 150 at-bats), but an ankle injury cost him another three weeks. His bat just wasn’t the same when he returned to the starting lineup in late June. He hit .278 over his last 342 at-bats with 51 runs, seven HRs, 25 RBI, and 15 SBs. On the positive side, he was able to play. The early reports in June had him missing the remainder of the season with his ankle injury. His K rate (14.7) almost matched his career average (14.2) while remaining well above the league average (20.3). Segura had his best walk rate (6.0) since his rookie season (7.8). Jean played well against both righties (.294 BAA) and lefties (.317 BAA). His swing path continues to deliver a high volume of ground balls (54.3) with a short fly ball rate (26.4). His HR/FB rate (9.5) was four percentage points below 2016. Talent player who tends to have a low average hit rate (1.427 in 2017). When paired with his high volume of ground balls, it paints a mediocre picture of his upside power. Draft him thinking .280+ batting average with 15 HRs and 30+ SBs with more value in runs than RBI. Segura has the talent to reach higher limits in home runs with minimal growth in his swing. Cano failed to deliver on his previous power (39) in 2017, which ultimately hurt his run total as well. He had his lowest CTBA (.327) since 2008 (.304), but Robinson was very good in the clutch (19 percent RBI rate). His walk rate (7.6) came in above his career average (6.5) with continued strength in his K rate (13.1). 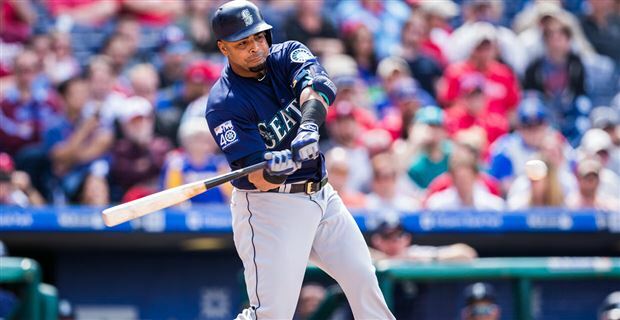 Cano was on track for 30+ HRs after the first two months of the season (.287 with ten HRs and 43 RBI over 174 at-bats) despite missing about two weeks in May with a quad issue. After a quiet first three weeks in June (.267 with one HR and six RBI over 75 at-bats), Robinson made a nice push in power over his next 18 games (seven HRs and 23 RBI over 71 at-bats). Over a six weeks period after the All-Star break, he just killed Fantasy owner with empty stats night after night (.256 with one HR and 15 RBI over 164 at-bats). Cano became relevant again over his last 27 games of the season (.324 with four HRs and 19 RBI over 108 at-bats). He lost his swing against lefties (.208 with four HR and 20 RBI over 178 at-bats) while maintaining a high level of success vs. RH pitching (.312 with 19 HRs and 77 RBI over 414 at-bats). Cano hit a high volume of ground balls (50.0 percent) for the third time in his last four years with Seattle. His HR/FB rate (14.7) was below his 2016 season (19.7), but it almost matched his career average (14.5). Robinson needs 624 hits to reach 3,000 hits for his career, which will take about four more seasons. He has strength in front of him in the starting lineup, and behind him, so a push in runs and RBI should be expected in 2018. Robinson is a great player with a great swing. Set his bar at .300 with 90+ runs, 25+ HR, and 100+ RBI, which will be well worth his draft value this year. Cruz has been one of the most consistent players in baseball over the last four years. Over this span, he has a high of 44 HRs and a low of 39 home runs while driving in over 100 runs in three of the last four seasons (108, 105, and 119). His CTBA (.385) remains high while still stepping back slightly from the last two years (.414 and .393). Nelson has an average hit rate over 1.900 in four of the last five seasons. After a couple of average years in RBI rate (14 and 15), Cruz moved back up with the league leaders in 2017 (19 percent) helping him lead the AL in RBI (119). He had eight HRs and 23 RBI in 131 at-bats vs. LH pitching, but Nelson only hit .229 despite a better approach (35 walks and 35 Ks). Cruz bashed righties .306 with 31 HRs and 96 RBI over 425 at-bats). After a fast start in April (.315 with seven HRs and 23 RBI over 89 at-bats), he wasn’t a difference maker over the next two months (.270 with seven HRs and 36 RBI). His power swing was in full gear over the last three months of the season (.291 with 25 HRs and 60 RBI over 282 at-bats) helped Fantasy owners make a push toward Fantasy titles. His HR/FB rate (22.0) has been over 20.0 for each of the last five seasons while regaining his fly ball swing (41.8) in 2017. Over his last seven seasons after the age of 30, Nelson has 246 HRs and 678 RBI. Cruz has been well worth his contract in Seattle, and he’ll be a free agent in 2019. A .280+ hitter with a 90/40/100 skill set while only qualifying at DH. Seager lost some life on his batting average due to his lowest CTBA (.308 since becoming a full-time starter in 2012. His average hit rate (1.806) was a career high, and it continues to show growth. Kyle had his second highest RBI chance (414) of his career. The bump to a lower slot in the batting order and less strength behind him in the starting lineup led to a slide in runs (72) after showing more strength in this area in 2015 (85) and 2016 (89). Last season Seager hit primarily in the 5th slot in the batting order. His batting average had the same failure against RH (.249 BA) and LH (.248) pitching while showing power vs. all pitching (19/60 vs. righties and 8/28 vs. lefties). He had a slight dropoff in his walk rate (8.9 – 10.2 in 2016) while still coming in higher than his career average (8.5). His K rate (16.9) still points to more upside in batting average. Over the first four months, Kyle hit .261 with 14 HRs and 55 RBI over 387 at-bats. He traded batting average for power over the last two months of the year (.225 with 13 HRs and 33 RBI over 191 at-bats). In 2017, Seager had a massive change in his swing path. His fly ball rate (51.6) was a career high and well above his last three years (41.1, 40.8, and 42.0). Even with more loft on his swing, Seager had a dip in his HR/FB rate (11.2). There is no doubt Kyle want to hit more home runs. Ths season he needs to find his balance back at the plate leading to a rebound in his batting average and an uptick in power. Potential breakout in batting average with a career high in runs, HRs, and RBI making him a value option at third base. Mitch looked like a great draft day find in 2017. His bat came out hot in April (.342 with 20 runs, four HRs, 16 RBI, and two SBs), but an oblique injury cost him the next six weeks. Haniger played well over his first 13 games after his DL stint (.280 with 12 runs, two HRs, and six RBI) before fading over five weeks (.157 with one HR and two RBI over 83 at-bats). Over this span, he battled a finger injury. A pitch to the face knocked Mitch out for three more weeks in August. In his last 38 games, he hit .318 with 22 runs, nine HRs, 23 RBI, and two SBs in 157 at-bats). HIs CTBA (.377) was supported by his 2015 (.387) and 2016 (.409) seasons in the minors while showing more growth in his average hit rate (1.740). Haniger was at his best against RH pitching (.292 with 12 HRs and 36 RBI over 277 at-bats) while not being dead in the water vs. LH pitching (.250 with four HRs and 11 RBI over 92 at-bats). Both his K rate (22.7) and walk rate (7.6) were below the league average. Over six season in the minors, Mitch hit .289 with 64 HRs, 274 RBI, and 38 SBs over 1,656 at bats. HIs HR/FB rate (15.8) was stronger in 2016 at AAA (24.4). His stats projected over 550 at bats last year would have been 86 runs, 24 HRs, 70 RBI, and seven SBs. In 2018, he’ll be pushed lower in the batting order with Dee Gordonadded to the starting lineup. Possible.280+ batting average with 75+ runs, 20+ HRs, and 75+ RBI. Ryon had a nice rookie season in the majors, but his free-swinging approach (3.8 percent walk rate and 23.5 percent K rate) didn’t fit the A’s style of play. Oakland shipped Healy to the Mariners over the winter, and he’ll take over at first base. Over four years in the minors, Healy hit .293 with 46 HRs and 238 RBI over 1,579 at bats. Ryon’s swing path showed growth in 2016 leading to his huge jump in HRs (27 over 606 at-bats). At 6’5” with a compact swing that produces a high volume of line drives, he looks ready to have continued success in power. In his minor-league career, he had a lower K rate (15.5) while his walk rate (4.2) remained short. Even with 18 HRs and 56 RBI over 439 at-bats against righties, Healy failed in batting average (.257) with a poor BB to K ratio (16:112). Ryon’s bat offered an edge against LH pitching (.314 with seven HRs and 22 RBI over 137 at-bats). Most of his production in 2017 came in May and June (.279 with 28 runs, 16 HRs, and 40 RBI over 215 at-bats). Nice add to the backend of the line for Seattle. His runs will have limited upside due to his expected slot in the batting order. With growth in his approach, .290 with 70 runs, 25+ HRs, and 70+ RBI. Zunino started 2017 with 30 strikeouts in his first 72 at-bats (.167 with no HRs and two RBI) leading to a trip back to AAA. He hit .293 in the minors over 41 at-bats with five HRs and 11 RBI earning another trip to the big leagues. While at AAA, Mike had five Ks in 45 plate appearances (11.1 percent). After another rough nine games with Seattle (.226 with one HR and three RBI over 31 at-bats while striking out 17 times), Zunino crushed the ball in June (.316 with ten HRs and 30 RBI over 76 at-bats). Even with his success, he still had a huge strikeout total (30). Over the last three months of the year, Mike hit .260 with 28 runs, 14 HRs, and 29 RBI over 208 at-bats. He had 83 Ks over this stretch. On the year, Zunino struck out 36.8 percent of the time with a slight edge in his walk rate (9.0). In 2017, his bump in batting average was due to a huge jump in his CTBA (.427 – .343 in 2016 and .280 in 2015). His HR/FB rate (24.0) has been elite over the last two year while producing plenty of fly balls (45.6 percent in 2017 and 47.6 percent in his career). Mike has the power to hit 40+ HRs with 500+ at-bats and the approach to hit his way out of the majors. His batting average (.251) is a trap. I see a .200 hitter with a 20/50 skill set. His swing and miss style will hurt his playing time when he’s not putting the ball in play. Despite hitting .304 in 1,043 at-bats at AAA with 17 HRs, 123 RBI, and 33 SBs, Gamel never had a real shot at the majors until 2017. His lack of a power/steal combo (27/95 over 2,677 at-bats in the minors) suggested that Ben was only a fourth outfield type in the majors. After hitting .300 over his first 60 at-bats at AAA with one HR, eight RBI, and one SB, Gamel was called up to the majors. His bat played well with Seattle over his first 57 games (.348 with 41 runs, four HRs, 27 RBI, and two SBs). His swing was much weaker over the second half of the year (.219 with 27 runs, seven HRs, 32 RBI, and two SBs in 288 at-bats). HIs K rate (22.2) was just below league average (20.3) with some work to do with his walk rate (6.6). Gamel was the same hitter against RH (.275 BAA) and LH (2.75 BAA) pitching. Ben has never had a HR/FB rate over 9.5 in his career at any level. Line drive type hitter with streaky upside in batting average. His resume shows more speed than power. With a bottom of the order opportunity, maybe a 15/15 skill set with short runs and RBI while producing a positive batting average. Over seven seasons in the minors, Vogelbach hit .284 with 100 HRs, 438 RBI, and 115 SBs over 2,417 at bats. His K rate (17.1) offers upside with a plus walk rate (14.3). Dan has some risk vs. lefties with a line drive swing. His skill set gives him middle of the order upside if ever given an opportunity in the majors. Vogelbach only has seven hits in 40 career at-bats with Seattle while striking out 15 times. He has a 20/80 skill set with plenty of roadblocks for at-bats in the majors. Ford has never had over 450 at-bats in any season in the minors. His best asset continued to be his approach at the plate (K rate – 13-3 and walk rate – 14.5). Over five seasons in the minors, Mike hit .272 with 50 HRs, 257 RBI, and four SBs in 1,542 at-bats. His best season came in 2017 between AA and AAA (.270 with 20 HRs and 86 RBI over 429 at-bats). Seattle selected him in this year’s Rule 5 Draft. Ford will have first chance at major league pitching in 2018, but Mike is blocked from gaining meaning full playing time without an injury. Mike Marjama (C) – Mike will compete for the backup catching job in 2018. Over seven seasons in the minors, he hit .275 with 37 HRs, 240 RBI, and 20 SBs in 1,783 at-bats. Marjama had his best year of his career in 2017 at AAA (.249 with 12 HRs and 63 RBI over 341 at-bats). Low upside player who could lose his opportunity in the majors if Seattle adds a veteran catcher. Taylor Motter (IF) – Motter has 338 at-bats in the majors over the last two seasons. He’s only hit .195 in his career with 40 runs, nine HRs, 35 RBI, and 12 SBs with the Mariners. Over seven seasons in the minors, Taylor hit .275 with 63 HRs, 281 RBI, and 133 SBs in 2,081 at-bats. He has talent and streaky value if needed to cover an injury in the infield or outfield. Both his walk rate (10.3) and strikeout rate (15.2) had strength in the minors. Andrew Romine (IF) – Romine has never had a chance to be a regular player in the majors. Over the last four seasons with the Tigers, Andrew hit .236 with ten HRs, 68 RBI, and 36 SBs in 927 at-bats. He’ll compete for a backup infield job in Seattle in 2018. Guillermo Heredia (OF) – Heredia hit .300 at two levels of the minors in 2016 over 343 at-bats with four HRs, 47 RBI, and five SBs after defecting from Cuba. He finished with more walks (48) than Ks (47). Over six seasons in Cuba, Guillermo hit .285 with 23 HRs, 121 RBI, and 20 SBs over 1,177 at bats. With Seattle over the last two years, he hit .249 with seven HRs, 36 RBI, and two SBs over 478 at bats. Role player only if he makes the roster out of spring training. Cameron Perkins (OF) – Perkins will compete for a backup outfield role this spring. He struggled over 88 at-bats with Philly in 2017 (.182 with one HR and eight RBI). Over six seasons in the minors, Perkins hit .282 with 39 HRs, 271 RBI, and 38 SBs in 2,176 at-bats. Cameron should start 2018 at AAA. Fantasy owners are waiting for Paxton to turn in a full season of starts in the majors. Headed into 2017, James flashed a step up in his skill set with growth in his walk rate (1.8). He ended up walking a few more batters last year (2.4), but it was below his first three seasons in the league (3.5). The best part of his improvement came from his higher K rate (10.3). Paxton dominated lefties (.198 with no HRs over 86 at-bats) while holding a winning edge over RH batters (.229 BAA with 134 Ks in 461 plate appearances). James was a better pitcher at home (7-3 with a 2.45 ERA and 90 Ks over 77 innings). Over his first five starts of the year, Paxton went 3-0 with 1.43 ERA and 45 Ks over 37.2 innings. A left forearm issue led to four weeks on the DL. He battled his command in June (14 walks over 25 innings), which led to a poor ERA (7.20), five HRs, and a high batting average against (.328). James didn’t allow over three runs in any of his last 12 starts of the year leading to an edge in his stats (7-2 with a 2.51 ERA, .206 BAA, and 77 Ks over 68 innings). Unfortunately, he missed close to five weeks over the second half of August and the front of September due to a pectoral injury. James has an elite fastball (96.0) with batters hitting .224 against his four-seamer. His curveball (.155 BAA) is tough to hit with high K ability, and his cutter (.203 BAA) is developing into a very good pitch. Rising ace with a developing skill set to match the top pitchers in the AL. If he pitched 200+ innings, sub 3.25 ERA with 15+ wins and 225+ Ks. Sound like an #EastCoast ride. There hasn’t been a lot of excitement in Hernandez’s skill set over the last two seasons. He’s 17-13 over his last 41 starts with a 4.01 ERA and 200 Ks over 240 innings. His K rate dropped to 7.5 over this span with a spike in both his walk rate (3.4) and HR/9 rate (1.4). Fade in command with a rise in home runs tends to points to a disaster elbow injury. Felix threw the ball well over his first three starts (2.95 ERA over 18.1 innings with no walks and 15 Ks). After two disaster games (eight runs, 21 baserunners, and three home runs over 8.1 innings), he landed on the DL with a right shoulder injury. When Hernandez returned in late June, his stuff was unimpressive over eight starts (4.02 ERA and 1.234 WHIP) due to ten HRs allowed over 47 innings. The Mariners shut him down for another six weeks leading to more crooked numbers over three games in September (4.85 ERA). HIs AFB (91.3) came at the bottom of his career range while being a slight tick over 2016 (91.2). Felix still has a plus slider (.154 BAA) and edge changeup (.196 BAA). His failure was due to a hittable fastball (four-seam – 338 BAA and .603 SLG and sinker – .295 BAA and .590 SLG). Hernandez had a HR/FB rate (22.4) that was nearly double his career average (11.4). A tough bet here, Felix didn’t have any surgery to repair his ailing shoulder, and his fastball suddenly won’t gain more value in velocity. His career resume (160-114 with a 3.20 ERA and 2,342 Ks over 2,502.1 innings) gives him a chance, but he needs to be sharp this spring with no injury news. At his expected price point, a sub 3.75 ERA and 175 Ks would still be a winning outcome. Leake ended up being a serviceable backend arm in 2017 after a bad showing in 2016 (4.69 ERA). For some reason, Mike never found his way in St. Louis (16-24 with a 4.46 ERA over 330.2 innings and 228 Ks) despite being a pitcher favoring ballpark. His walk rate (1.8) has been at the top of his career range over the last two seasons while still having a short K rate (6.3). After arriving in Seattle, Leake had a nice run to close the year (3-1 with a 2.53 ERA, two walks, and 27 Ks over 32 innings). On the year, Mike struggled against lefties (.288 with ten HRs while issuing 24 of his 37 walks). His season started off at a high level after his first nine starts (1.91 ERA and .210 BAA). Over his next 17 starts, Leake had more disaster than upside (2-10 with a 5.73 ERA and .324 BAA). HIs AVH (91.6) remain below the league average. Batters crushed his sinker (.333 BAA), changeup (.298 BAA), and curveball (.419 BAA) while owning an edge with his cutter (.175 BAA) and slider (.173 BAA). Mike is a groundball pitcher (53.7 percent) who tends to have a high HR/FB rate (13.6). Veteran inning eater who will have many ups and downs over the long season. His final destination tends to fall just under 4.00 ERA with below par Ks. Ramirez has been a slightly better pitcher as a reliever (4.04 ERA) than a starter (4.25 ERA) in his career. His best season came in 2015 (11-5 with a 3.75 ERA with 126 Ks over 163.1 innings) while splitting time in a dual role. Home runs tend to be his Achilles heel (1.3 per nine in his career). In 2017, Erasmo looked good over his first 15 games (2.92 ERA with 27 Ks in 37 innings, which included two starts (four runs allowed over 11.1 innings with seven Ks). Tampa pushed him into the starting rotation in late May, but he was much easier to hit (8.23 ERA and .345 BAA over 27.1 innings). His slide led to a trade to Seattle. Ramirez allowed two runs or fewer in seven of his 11 starts to end the year leading to a 3.92 ERA and 54 Ks over 62 innings. He had a low walk rate (2.1) in 2017 with a career-high K rate (7.5). Erasmo has more failure against lefties (.270 with 11 HRs over 196 at-bats). His AFB (92.2) was a career low. Batters drilled his sinker (.338 BAA) while struggling to make contact vs. his changeup (.200 BAA), his cutter (.243 BAA), and his four-seam fastball (.130 BAA). Command pitcher with a battle of disaster and serviceable innings. More of gap pitcher within the season. If he’s pitching well, ride him out. When Ramirez starts serving up long balls, bounce him back to the free agent pool. Moore pitched great between High A and AA in 2016 (12-4 with a 2.65 ERA and 133 Ks over 163 innings) putting him on the fast track to the majors last year. He had more follow through at AA (2.08 ERA) last season leading to a promotion to AAA in early May. After nine starts, Andrew had 3.06 ERA with 48 Ks over 53 innings and a ticket to the majors. Moore allowed three runs in each of his first three starts with Seattle, but he allowed five HRs over 21 innings. His lack of swing and miss ability led to a bad three-start run (8.04 ERA, .328 BAA, and six HRs over 15.2 innings). Over his last six starts at AAA, Andrew allowed four runs over 22 innings with 19 Ks. His stuff played better in the majors in September (3.48 ERA and 14 Ks over 20.2 innings). With the Mariners, Moore had plus command (1.2 walks per nine) with a huge HR/9 rate (2.1) and low K rate (4.7). His AFB (91.4) had a short, but batters hit only .222 vs. his four-seam fastball. Andrew doesn’t have an edge offspeed pitch while relying on his changeup, slider, and curveball. The some of the parts are better than his stuff. Moore has the talent to earn the fifth starting job out of spring training with his biggest obstacle being his donations to the fans in the outfield stands. Gonzales looked like an upside arm headed into 2015, but he battled a shoulder injury leading to a disappointing year (4.69 ERA). Marco missed 2016 with TJ surgery. Over four seasons in the minors, Gonzales had a 3.20 ERA with 274 Ks in 321.1 innings. Last year he handled himself well at AAA with the Cardinals (6-4 with a 2.90 ERA over 68.1 innings with 57 Ks. Marco struggled in his only start with St. Louis (five runs, six baserunners, and three home runs over 3.1 innings). They decided to move him to Seattle at the trade deadline. Over the last two months, Gonzales posted a 5.40 ERA and .340 BAA over 36.2 innings with 30 Ks. His AFB (92.1) was a career high in the majors. Marco features a four-seam fastball, curveball, and changeup combination. His changeup is the key to his pitch ability in the majors. Arm to follow this spring as he’s more than just an inning eater once he finds his command with Seattle. Over four seasons in the minors, Povse has a 22-19 record with a 3.92 ERA and 297 Ks over 354 innings. He has a low walk rate (2.3) with weakness in his K rate (7.6). His stuff played well at AA (7-3 with a 3.12 ERA and 80 Ks over 109.2 innings), but Max struggled in 2017 at AAA (7.39 ERA) and in the majors (7.36 ERA). His fastball rates in the low 90s with more upside and explosiveness when he adds more bulk. Povse doesn’t have an edge with his curveball or his changeup at this point in his career. Developing arm, but he looks to be at least a year away from being a back of the rotation arm. Diaz appeared to be a young impact closer headed into his second season in the majors. He struggled in six of his first 16 games (5.28 ERA) due to poor command (ten walks over 15.1 innings) and home runs (4). Even with his failure, Edwin converted seven of his first nine saves. He pitched better headed into the All-Star break (3.09 ERA and 30 Ks over 23.1 innings), but his down days still came from walks (10) and HRs (5). Over the second half of the season, Diaz had a 2.87 ERA with 43 Ks. He cleaned up the HRs (2) over this period, but Edwin issued 16 more walks. In the end, his walk rate (4.4) was much higher than 2016 (2.6) with a drop in his K rate (12.6). Both RH (.182 BAA) and LH (.184 BAA) batters struggled to hit him. His AFB (97.8) is special leading to batters only hitting .207 against it, but he did allow seven home runs off his four-seamer in 140 at-bats. Diaz also has an elite slider (.142 BAA). An electric closer who tends to get himself in trouble with his command. If/when Edwin figures out how to throw strike one (only 55.8 percent in 2017), he going to be one of best closers in the game. Sub 3.00 ERA with 40+ saves and a chance at 100+ Ks. Nicasio started to put it together as a reliever in 2017. He had the best walk rate (2.5) of his career, but he struck out fewer batters (9.0 per nine) compared to 2015 (10.0) and 2016 (10.5). His stuff played well vs. both righties (.224 BAA) and lefties (.208 BAA), but he issued 14 of his 20 walks to RH batters over 147 at-bats. Juan struggled in June (6.10 ERA) and August (4.63 ERA) while being electric over his other four months (1.62 ERA and 1.127 WHIP). His AFB (95.7) was the best of his career with batters only hitting.221 vs. four-seam fastball. Nicasio has an elite slider (.214 BAA) as well. A nice developing arm that is getting closer to being closer-worthy. For now, Juan will man the 8th innings for the Mariners. Phelps struggled over his first eight games in 2017 (8.10 ERA and 3.78 BAA) while serving up three home runs over ten innings. His arm looked closer-worthy from April 23rd to June 4th (no runs, seven hits, and 19 Ks over 19 innings) before giving back his gain over another bad ten game stretch (7.20 ERA and 3.24 WHIP over ten innings). David had a 2.16 ERA with 21 Ks over 16.2 innings in July and August. An elbow injury that required surgery in mid-September cost him most of the last seven weeks of the season. He had a tougher time with lefties (.278 with four HRs over 108 at-bats). His AFB (95.0) was the best of his career. Hitters struggled against his four-seam fastball (.190 BAA), curveball (.180 BAA), and cutter (.239 BAA). Seattle hopes to have him back on the mound this spring. His surgery was needed to remove bone spurs. Not quite ready to pitch in the 9th due to his high walk rate (4.2 in 2017, 3.9 in 2016, and 3.5 in his career). The Mariners signed him to a $5.5 million deal in December with the idea that Phelps will improve the 7th inning.